Another plant for treatment of bio waste also had become operational at the Municipality of Thrikkakara in Eranakulam District. The implementation of this project was completed with the technical assistance of BIOTECH, Trivandrum which is implementing the various bio energy programs with the approval and financial assistance of the Ministry of New and Renewable Energy (MNRE) Govt. of India. After evaluating the successful working of the existing plant installed 3 years ago in the Municipal Market which had capacity for treating 250 Kg. per day, the construction of a new plant having the capacity for treating the 500 Kg. of waste had since been completed as the second stage. 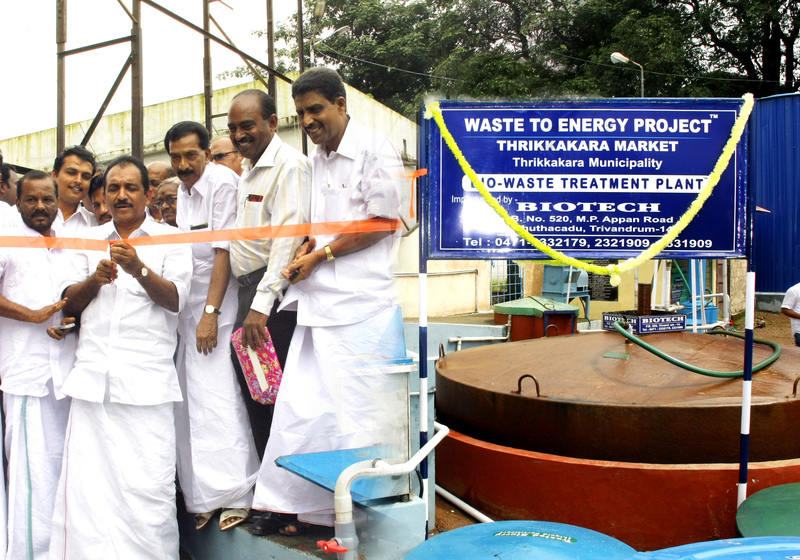 This plant is the third waste treatment plant installed in the Thrikkakara Municipality. The plant was inaugurated by Shri. Benny Behanan, MLA, Thrikkakara at 10.30 am on Friday the 27th July 2011. Shri. P.I. Muhammad Ali the Municipal Chariman presided over the inaugural function. The project was completed after spending a sum of about Rs. 16.80 lakhs towards the cost of the plant and the ancillary equipment. The latest waste treatment bio-methanation multistage technologies had been applied in this plant. With the completion of this plant apart from treating 500 kg. of waste per day in an eco-friendly manner it could also be possible to generate 5 KV of electricity as well. By utilizing the electricity generated from the plant it would be possible for lighting 150 CF Lamps installed in the market and the near by areas.